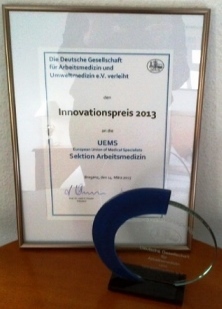 We are pleased to be able to report that the UEMS, through its Section of Occupational Medicine, was granted the DGAUM Innovation Award 2013. The UEMS Executive takes this opportunity to congratulate the elected officers and delegates of the UEMS Section of Occupational Medicine on this achievement. We hereby reproduce the letter of award that Dr Alenka Skerjanc, Secretary General of the Section, has received on that occasion. Since 2006 Deutschen Gesellschaft für Arbeitsmedizin und Umweltmedizin (DGAUM) - German Association of Occupational Medicine - Innovation Award has been dedicated to an individual, to a group of people or to an institution that made an important contribution to the development of profession by their innovative achievement in research, education and training or quality assurance. The prizewinner for this year's German Association of Occupational Medicine Innovation Award is the UEMS, European Union of Medical Specialists - Section of Occupational Medicine. The European Union of Medical Specialists - Section of Occupational Medicine was established in 1997 and involves representatives from almost all European Union member countries. Section of Occupational Medicine strives to support the development of occupational medicine all over Europe in order to improve the well being of the work force. This aim shall be achieved by strengthening the role of occupational medicine in public, by advising to EU Associations, by incentives to international cooperation, by quality assurance of specialist education and by continuous medical education. The UEMS Section of Occupational Medicine has been developing successfully since its establishment. Actually it has become an important instrument to strengthen international network in order to share experiences, to plan joint international projects and also to find out influence at the political level. The UEMS Section of Occupational Medicine tends to be present in planning EU Safety and Health Strategy 2013 – 2018. The Statement of UEMS Section of Occupational Medicine on European Working Time Directive required hard work of the group. The review article on the impact of long working hours on doctors' health will be published in near future. The Section is continuously bringing new innovative concepts into their activity. The award will be presented to the official representative of the Section Board, our colleague Dr. Alenka Skerjanc from Slovenia. Dear colleague Skerjanc, it is a pleasure to present you the Innovation Award for this season on behalf of the UEMS. I would ask you to transmit the thanks of our scientific association and best wishes to all the colleagues in the UEMS.